Some of the world’s best known beach resorts may not survive projected sea level rises, a leading coastal scientist at the University of Ulster has warned. Professor Andrew Cooper, Professor of Coastal Studies in the School of Environmental Sciences at the University, said a rise in sea level of even a few feet could threaten some of the world’s most iconic resorts like West Palm Beach in the US, Cancun in Mexico, Cannes in the south of France, Torremolinos in Spain and Dubai in the United Arab Emirates. And he also claimed the problems caused by changing sea levels are compounded by a lack of political will and a lack of short-term coastal management initiatives. Professor Cooper has investigated and reported on the world’s coasts in a research and teaching career that has taken him to more than 50 countries on six continents over the past quarter century. He co-authored the book 'The World’s Beaches: a global guide to the science of the shoreline' last year. The Coleraine-based academic said that while the most pervasive driver of coastal change at present is global sea level rise, rising sea levels alone do not necessarily threaten beaches. The problem arises when beaches are artificially hemmed in and not given room to move. Professor Cooper explained: “A key attractor in most of the world’s examples of coastal resort cities has been the presence of an adjacent beach. "Some well-known examples are Benidorm, Torremolinos, (Spain), Cannes (France), West Palm Beach, Florida, Atlantic City, New Jersey (USA), Myrtle Beach, South Carolina (USA), Virginia Beach, Virginia (USA), Cancun (Mexico) and the most rapidly developed of all coastal resort cities, Dubai (United Arab Emirates). In all of these resorts the challenge is to preserve the real estate behind the beach and still save the beaches, which are being pushed landwards by rising sea level. Beach replenishment or nourishment is sometimes seen as panacea for disappearing beaches but, according to Professor Cooper, this is not a solution either. “There are a lot of issues with beach nourishment - not least the cost – but beach nourishment would not be needed if developments were properly planned in the first place to give beaches room to move.Maintaining resort beaches by nourishment is a major challenge with rising sea level." Professor Cooper recently published the results of a study along Australia’s Gold Coast to assess adaption options for coastal resort cities. The study, believed to be the first of its kind to specifically assess adaptation options for coastal resorts, could become a blueprint for other resorts around the world. 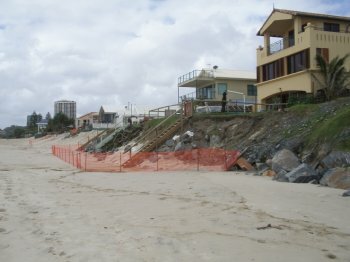 “On developed coasts, human activities dominate over natural processes in shaping the coastline.Beach resort cities are mostly artificial creations on the shoreline that rely on beach nourishment to sustain them and on their reputation for a clean and safe environment. To maintain this during rapid sea level rise will be near impossible.To hold beaches stationary while sea level rise is pushing them landwards will require a massive increase in the amount of sand being pumped onto beaches. “Our study of resorts along the Gold Coast of Australia suggests that with advance planning, we might just cope with a 1metre sea level rise but not even careful planning beforehand could enable resorts to survive more than that.